BREAKING: HHS Secretary Tom Price Resigns - Joe.My.God. Health Secretary Tom Price resigned from his Cabinet post on Friday, the White House said, after racking up at least $1 million in travel on private and military jets, a string of taxpayer-funded expenses that drew bipartisan condemnation. The former Roswell orthopedic surgeon had lost support from President Donald Trump, who said Wednesday that he was “not happy” with his health secretary despite Price’s pledge to pay back taxpayers for part of the bill and to stop flying on chartered jets. The White House said Don Wright, a top deputy at the department, would serve as acting secretary of Health and Human Services until a new secretary can be confirmed by the Senate. 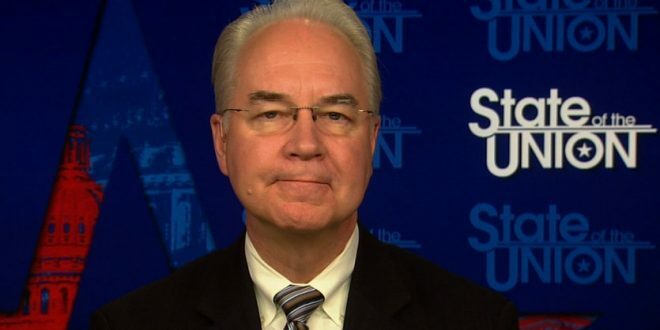 Price’s departure came after the news outlet Politico reported in a series of stories that the health chief had taken more than $1 million in taxpayer-funded trips on private planes to locales from Africa to Georgia’s St. Simons Island.